Sd.Kfz. 231 SCHWERER PANZERSPAHWAGEN(8-Rad) . Features: - Newly produced Sd.Kfz.231 w/fine details - Well-defined vision ports on turret and hull - Spade realistically molded - Turret made by 3-directional slide mold - Slide-molded upper hull - Slide-molded fenders w/on-vehicle tools - Underside of hull made by slide mold - Intricate 2cm KwK 30 L/55 auto-cannon and MG34 included - Injection-molded tow cables reproduced - Highly detailed rear hull - Delicate grill on engine deck - Turret hatch can be assembled open/closed - Sharply reproduced cargo and jerry cans - Chassis possesses full detail - Detailed wheels w/authentic tire tread pattern Germany created a number of successful schwerer Panzerspahwagen (“heavy armored reconnaissance vehicles”) to support its forces. In fact, a whole family of vehicles was based on the Sd.Kfz.231 8-Rad (“eight-wheel”) design. This type of heavy armored car was ordered in 1934, and one of its special features was its chassis that featured 8-wheel drive and 8-wheel steering. This chassis was produced by Bussing-NAG and it offered good cross-country mobility. There were dual driver’s controls, which meant the vehicle could drive rapidly in either direction if it came under attack. 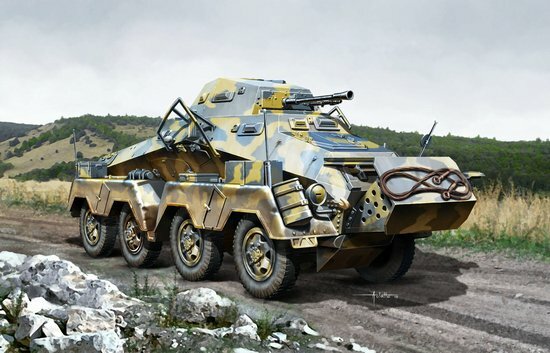 The 8.3-ton Sd.Kfz.231 was built from 1936 through till May 1942, with some 607 vehicles produced in all (including the closely related Sd.Kfz.232). The Sd.Kfz.231 had a hexagonal-shaped turret mounting a 2cm KwK 30 cannon plus one MG34 machine gun.